Today is the day I get to share my Holiday Lane pillow with you. I already had a pillow form I wanted to use so I made some changes to the pattern so that it would fit my 12”x22” pillow form. I omitted two houses and I also did the “flange” differently. I don’t really care for big fluffy, floppy pillows. I like a more streamlined look. If you want your pillow to look like mine you can just do a regular quilt binding. I was tempted to go all out with the quilting but I decided to keep it simple. All of the quilting was done with my walking foot. I wanted to show my “31 Days of Walking Foot” readers that walking foot quilting can be more than straight lines. My applique was done differently than most. I use a stabilizer on the back as a “sew in template.” Once washed the stabilizer becomes softer with each successive wash. I can write up a tutorial if you are interested in learning this technique. I like to glue everything in place and layer the quilt sandwich so that my applique stitches also become quilting stitches. I backed the sandwich in a random blue that I had lying around since this goes in the middle of the pillow no one will ever see the blue. I quilted the “sky” in a design I’m calling “windy clouds.” It is a combination of “waves” and “water.” The difference is that instead of curving back gently like I did in “water” I chose to pivot back in a sharp point. 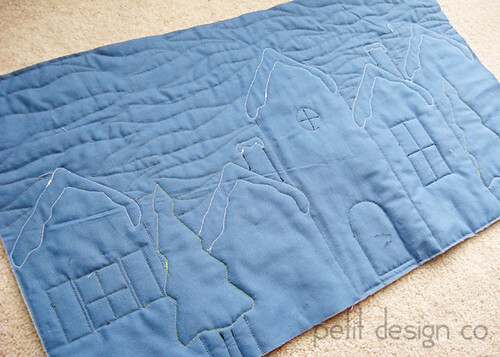 I quilted in the ditch around the houses and outlined each of the applique items (trees, windows, doors.) I like the puffiness of the houses so I choose to leave them without quilting. Here is closer shot of the front so that you can see the stitching I did in the sky. Remember the mini zig zag I shared with you before Thanksgiving? Well I threw it on the back just for funsies! Each HST unit measures a measly 1” and it wasn’t really that fun working with that much bulk in a tiny space. It sure looks cute though. Go visit the other hoppers for today! For now the pillow is living on my bed until the Christmas decorations go up. Usually we do the tree on Black Friday because we don’t partake of that particular tradition :) I hate crowds! We had company this weekend so the decorations will go up this week. Is your house all decked out already? Love your smaller version and the fabrics are lovely! Love your pillow! Great fabric choices! Lovely pillow! I like the smaller size. Your fabric choices are wonderful. Nice quilting! Your pillow is adorable, love the quilting, the colours and the changes you made in the pattern! our decorations go up 8 Dec... following catholic tradition. Really looking forward to it! Great pillow - I love the quilting in the sky. I love your pillow, great job!! Great cushion! and thank you for showing the back so we could see exactly how you quilted it! Very nice. I like the smaller pillow you made. Lovely pillow, very nicely done! Great pillow - you did a wonderful job! It's beautiful -- I love the way you did the quilting. I haven't quilted anything yet, and the simplicity of your style here is very appealing to me. It`s super cool and love your fabrics too! VEry pretty, thanks so much for sharing. Hi!! It is very pretty!!! 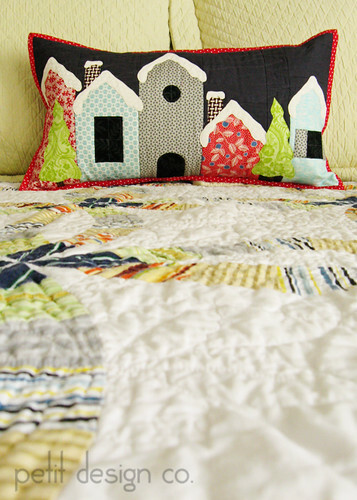 Great pillow...love the quilting and the simple border! Great idea! I'm interested in how you did the applique. It looks so neat on your pillow. Mine doesn't lay as pretty as your's does. What stablizer do you use? Great pillow! 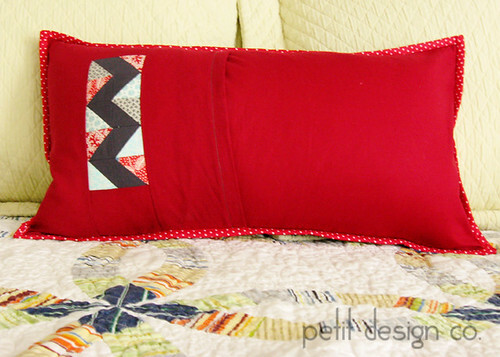 Very neat pillow; love the red dotty binding. I do follow you; you are so informative. Yes, I'd like to have a tut on the stabilizer thingy. Thanks for all the quilt stitching notes and tips. Your pillow is very nice! Great job! So very darling! I love your modifications, too (so versatile)! Beautiful project! FWIW, I did a lot of straight line quilting (with a walking foot) on my pillow, too--it just seemed right with the geometric prints I used. Hello Fellow Poster, Love your pillow. Just getting around to see what everyone has made. Thanks For Sharing! Your pillow is very pretty and petite. Great idea. Cute little pillow. Thanks for sharing. I like the way you did the binding. Thanks for sharing and being in the hop. Very sweet......I like it smaller for some spaces. You did a very nice job on your pillow. It was a fun pattern to play with. Thank you for sharing. 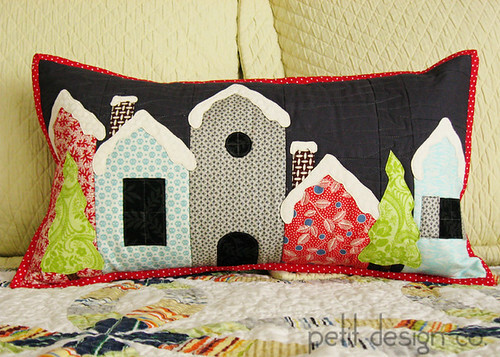 pretty pillow and great quilting! I love this! It's so classic with just a touch of Christmas! Beautiful pillow! Thank you for sharing. Nice choice for a smaller version and matches the quilt on your bed quite nicely. I like your pillow a lot. well done. Wonderful pillow. I like that you did a tut on your methods. I also checked out your 31 days of walking foot. I am now a follower. absoutely gorgeous, great quilting too. sew pretty in a smaller size. I like your color choice. Thanks for sharing your pillow and the quick tutorial of how you did it. It is an awesome pillow! Love your pillow and the way you did the outer edge! After I finished mine I didn't care for the flange either... I gave the pillow to my MIL today and she loves it so it all ended well. I don't do Black Friday either.. people are crazy!! I really like the black background. Your pillow turned out just great! I love seeing all of the different houses. Very nice and and I like that it's not Christmasy so you can use it for the winter months. 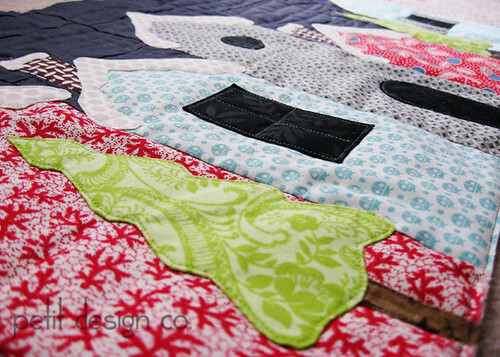 Great pillow and love that you used quilt binding method instead of the flange. Great idea! I love your pillow. Thanks for sharing. lovely! The quilting is so effective. I suspect our decorations will go up a few days before christmas as usual! Love your pillow...great fabric choices and I love the size. Thanks for sharing.